The George Foreman 15-Serving Indoor Outdoor Electric Grill is easy to put together and lightweight so it can easily be moved from outside to the kitchen counter or even the table. Additionally, with 240 square inches of grilling space, you can cook 15 servings on the grill at once. This electric grill must have been designed with condo and apartment dwellers in mind because this electric grill can go from the kitchen to the patio or vice versa in a flash. When it starts raining out on the patio just grab the grill off the stand and move it to the kitchen counter and plug it back in to finish grilling without the mess of charcoal or the fumes and possible flare ups from propane. You’re going to love how easily this electric grill cleans up without compromising great taste or those grill marks. They call it the “George Tough Nonstick Coating” and it’s not only durable and easy to clean, but makes for a much healthier meal because it all but eliminates the need for grease, oil, or butter to cook with so the grill just cooks off the fat and grease from the meat and leaves you with a healthy cut of meat that is cooked to perfection. You can set the grilling temperature from 1 to 5, 1 for the slow-cooked goodness of a smoker under the domed lid, to the 5 setting for the high-temperature searing required to grill the perfect steak. Once you get the grill setup, you can turn it on and let it heat up while you prepare the food. It may take some experimentation or time to become familiar with the settings and figure out which is the best settings for which cuts of meat, but once you know, you can count on consistent cooking times, unlike a charcoal grill. This adds predictability and takes the guess work out of preparing that steak the way your guests want it. The George Foreman 15-Serving Electric Grill is a great indoor-outdoor grill for the money. Apartment dwellers and their landlords will love this totally electric grill because there’s no charcoal mess and only a minimal chance of fire, less than your toaster, actually. 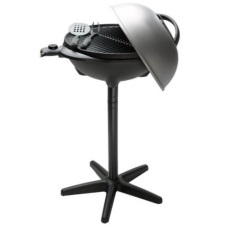 We found 2,594 confirmed Amazon purchasers that rated this indoor-outdoor electric grill. They gave it an average rating of 4.4 stars out of a possible 5 stars. Out of the 2,594 customer reviews we found, 87 percent of customers rated the George Foreman electric grill either 4 or 5 stars. You must figure George is doing something right if nearly 90 percent of the buyers found this electric grill to be a good or excellent buy … in fact it has earned the Amazon’s Choice title. A few of the commenters wish they would make the stand a little more stable and add hooks to hang the cooking utensils from, perhaps George will listen, but in the meantime, it is still a great little grill for the price. In summary, the George Foreman 15-serving electric indoor-outdoor grill is perfect for condominium and apartment dwellers, either in the kitchen or on the patio. It’s easy to setup and cleanup, which makes it a good grill at a great price.